When we first introduced the Logline submission form at the Embryo Films website, a curious thing began to happen. Full grown adult men and women began attempting to cram an entire movie into a tiny little box. And funnily enough, a quick search around the internet shows that grown adult men and women around the world continue to try to cram entire brainfuls of ideas into Loglines that simply aren't big enough to accommodate them. You've seen them. They're these enormous run-on sentences your English teacher would've castigated you for (she would've probably told you not to end your sentences with prepositions, too, but let's not get off topic). And next thing you know, your "two sentence" logline qualifies for the Guinness Book of World Records as the longest sentence ever written. It's not a logline at all. It's an abbreviated attempt to tell the story. The secret to creating compelling loglines is to make a very specific distinction in your mind between CONCEPT and STORY. When you're creating a logline, don't try to tell the whole story in one sentence. Instead, encapsulate your CONCEPT. And here's where most writers go off-track. They think CONCEPT and STORY are the same. Storytelling requires two or more people. First is the writer. That's you. Without you, the story doesn't exist. Second is the audience, which can be one listener or reader, or it can be a global viewing audience of several billion people. Without the audience, the story might as well not exist. The fundamental mistake most writers make is that they forget about the audience. Why should an audience want to see your film? What about your film is compelling? There are hundreds (even thousands) of ideas, images, stories and distractions out there. What is it about YOUR idea that's going to stop someone dead in their tracks and DEMAND to know more? But what if you weren't trying to tell him your whole story -- and you merely tried to grab him with your CONCEPT instead? Could you pique his interest enough in 15 seconds to get him to ask for your business card? Sure you could. But you're going to need to polish that pitch, aren't you? THAT'S what a logline is all about. Craft a one- or two-sentence pitch that GRABS THE READER ENOUGH TO MAKE THEM ASK FOR MORE. Don't even BOTHER trying to tell the whole story. No one has time, even if they WERE interested. Just GRAB them. Make them ask for more. QUESTIONS engage the reader's mind. For example, "How would somebody get out of THAT situation?" 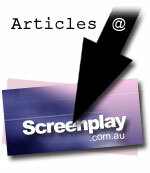 or the best screenwriting question a reader can ask, "Wow, what happens THEN?" IDEAS engage the reader's mind. For example, when you create an unusual or intriguing scenario. STAKES engage the reader's mind. For example, when someone we care about is in danger of losing something THEY care about. Because the human mind is infinitely fascinated by the unknown, there are countless ways to engage your reader's mind. But that's the key. Engage your READER'S mind. When you do, and you whittle it down into one or two sentences that stops a stranger dead in his tracks, you'll have a compelling logline. And then watch as your script gets requested repeatedly. Jeff Bollow, founder of Screenplay.com.au, is an award-winning filmmaker, acclaimed screenwriting teacher, creator of FAST Screenplay, co-founder of New Zealand's Big Mountain Short Film Festival, and author of two best-selling books. This article is copyright © 2005 by Jeff Bollow, and may not be reprinted without permission. You are free to link to this page, provided it is not within a frame on an external site.